Tonnages: 16,598 gross 10,093 net 26,066 deadweight. Engine: M.A.N. K7SZ70 oil engine, hp by Mecanica Pesada S.A. Tourbate 13,300 bhp 15 knots. 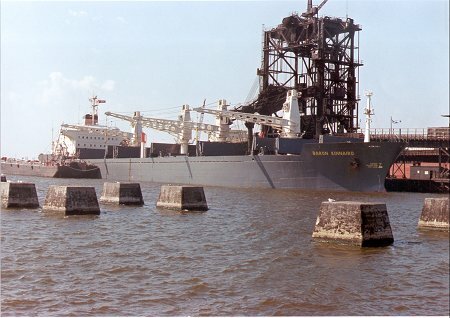 December 1981: Completed by CCN-Maua, Rio de Janeiro (yard No. 142) for H Hogarth & Sons Ltd.,Glasgow. Scottish Ship Management Ltd., Glasgow, managers. Maiden Voyage: Rio de Janeiro to Angra dos Reis and Vittoria. Loaded steel for Antwerp. 1984: Managers became Scottish Ship Management Ltd., Bermuda. Bermuda flag. 1985: Sold to Salvador Shipping Co. Ltd. Managers became Scottish Ship Management Hong Kong. Hong Kong flag. 1987: Sold Yukon Shipping Ltd. Denholm Ship Management (Overseas) Ltd. managers Hong Kong flag, renamed CINCINNATUS. 1990: Sold Quad International Ltd. Ramon de la Sota Jr. managers. Renamed LABURDI. Hong Kong flag. 1994:	Sold The seaway Navigation Corp. Densh Management Corporation managers, renamed LARA K Bahamas flag. 1997:	Sold Heart Navigation Co. Ltd renamed MARITIME BANGKOK. Panama flag. 1999:	Sold Bangkok Navigation Co. Pte. Ltd. IMC Shipping Co Pte Ltd Singapore, managers. Singapore flag renamed MARITIME RAYONG. 2000:	Sold to Millenium Shipping Co. Ltd. Marineros Compania Naviera S.A managers. renamed MANA. Malta flag. 2003: Sold to Good Luck Maritime. Oceanstar Management. Renamed ALEXIS. Malta flag. 2009: Sold to Fraternity Corp. Panama. Livanbros Marins, managers. Renamed ST GEORGIOS, Panama flag. 2009: October, broken up, India. Photo by I. Warner, Information - J. Drury.